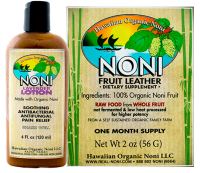 A ready-made lotion version of Noni Fruit Leather that can be applied topically. Works great for multiple skin irritations and pain relief. Noni fruit is a Polynesian superfood that contains over 165 beneficial compounds in its raw form. Noni is a tropical tree known scientifically as Morinda Citrifolia. The true traditional use for thousands of years among Polynesian cultures was to eat raw noni fruit to maintain overall health and wellness. Noni fruit contains vital micronutrients, including natural antioxidants, soluble and insoluble fiber, essential fatty acids, and countless other vitamins and minerals, which work together to promote good health. From our organic family farm comes the healing power of noni. Our Noni Fruit Leather is made from 100% non-fermented organic raw noni fruit pulp. We use an unique low heat drying process to maintain the beneficial enzymes and compounds for maximum potency. Published research has shown Noni Fruit Leather to be 14x more potent than noni juice. It is raw food with absolutely no additives or preservatives. Each package of Noni Fruit Leather has a 2 year shelf life not refrigerated. Noni Lavender Lotion is our Noni Fruit Leather in a water base and is a wonderful use of noni as an external health aid. Noni Lavender Lotion helps promote an even skin tone and healthy complexion. This lotion is safe to use on the face and sensitive skin areas. Made from 100% organic raw noni fruit pulp that is low heat processed to preserve enzymes and non-fermented for higher quality and potency. We add organic Lavender Oil from France for a soothing and relaxing fragrance. No refrigeration is necessary. Each bottle of Noni Lavender Lotion has a 2 year shelf life. Made with the same principles in mind as our standard Noni Lavender Lotion, the IcyHeat Noni Lotion is specifically designed to treat closed-skin ailments such as joint pain, bruises, inflammation and cramps. Our IcyHeat Noni Lotion has Camphor Oil and Menthol Crystals added to the formulation for quickness of response. No refrigeration is necessary. Each bottle of IcyHeat Noni Lotion has a 2 year shelf life. Note: Because this product contains Camphor and Menthol, we ask you to refrain from using this product on your face or senstive skin areas. Instead, we advise you to use our standard Noni Lavender Lotion since it does not contain Camphor or Menthol. Noni fruit is believed to be so effective because of its antioxidant abilities. For basic maintenance (to keep yourself healthy) simply take one 2 inch by 2 inch pieces per day. For persistent conditions take two to four 2 inch by 2 inch pieces per day. Start with two pieces per day and if you are not getting the desired results simply up the dosage to 4 pieces per day. Take half in the morning and half in the evening as raw food. To use Noni Lavender Lotion, simply clean the skin before application. Then pump an appropriate amount into your hand and apply liberally to the problem area, let air dry or continue rubbing to exfoliate the skin. Apply 2-3 times daily for less persistent conditions, and 4 or more times daily for more persistent conditions. Apply the lotion and continue rubbing into the skin to exfoliate and cleanse. First, make sure that the problem area does not have any broken skin. Then, clean the surface of your skin and apply liberally to the problem area, let air dry or continue rubbing to exfoliate the skin. Then, prepare to feel relief! Apply 2-3 times daily for less severe conditions, and 4 or more times daily for more severe conditions. Note: Because this product contains Camphor and Menthol, we ask you to refrain from using it on your face and sensitive skin areas. Instead, we advise you to use our standard Noni Lavender Lotion since it does not contain Camphor or Menthol.